Timothy Q. Mouse: [the elephants' chatting catches his attention] Huh! A guy can't eat in peace. Timothy Q. Mouse: Gab, gab, gab. They're always gossipin'. Ringmaster: Here, you! What's going on? [Jumbo angry with straws down] Down! Mrs. Jumbo, down! Surround her! Tie her down! [Jumbo angrily trumpeting Dumbo crying] Get down! [Jumbo angrily trumpeting] Calm down! Tie her down! [Ringmaster shrieking and splashing out the water] Brrrrrrrr! Timothy Q. Mouse: Now I wonder how we ever got up in that tree, anyway? Timothy Q. Mouse: Now, let's see - elephants can't climb trees, can they? Nah, nah, that's ridiculous. Would they jump up? Mm-mmm. Too high. Jim Crow: Hey there, son. Maybe y'all flew up. Timothy Q. Mouse: That's it! Dumbo! You flew! Boy, am I stupid. Why didn't I think of this before? Your ears! Just look at 'em, Dumbo! Why, they're poifect wings! The very things that held ya down are gonna carry ya up, and up, and up! Timothy Q. Mouse: [he's just revealed a peanut under his hat] Dumbo, look what I've got for ya! Timothy Q. Mouse: Ah-ah-ah-ah, you have to come out foist! Timothy Q. Mouse: You know? Your ma ain't crazy. She's just broken-hearted. And it ain't nobody's fault you got them big ears. Timothy Q. Mouse: Oh boy, I stepped in it that time. Timothy Q. Mouse: Aw gee, Dumbo, I think your ears are beautiful! Timothy Q. Mouse: Sure! As a matter of fact, I think they're very decorative. Timothy Q. Mouse: You know, lots of people with big ears are famous! Timothy Q. Mouse: Where is he? Oh. Timothy Q. Mouse: Hey Dumbo, you can come out now. Timothy Q. Mouse: [startled] Golly. Must have scared him too. But look, Dumbo, I'm your friend. Come on out, won't ya? Timothy Q. Mouse: You're not really afraid of little me, are ya? Timothy Q. Mouse: Ya are? Timothy Q. Mouse: Must have overdid it in there, don't know my own strength sometimes. Timothy Q. Mouse: [shift-shapes into a ghostly figure next to the Ringmaster's ear with just his eyes showing, utters mysteriously] I... am the voice of your subconscious mind. Your inspiration. Nowwwwwwww - concentrate! Timothy Q. Mouse: [sticking his hand out at first, then revealing his face entirely] Remember? Your pyramid of elephants are standin' in the ring, waitin' for a climax! Timothy Q. Mouse: [mysteriously] You are now getting that climax. Timothy Q. Mouse: [rushes to the Ringmaster's ear, almost whispering, suddenly concerned] How's the reception? Comin' through okay? Timothy Q. Mouse: [smiles] Good! Timothy Q. Mouse: Suddenly, from the sidelines, comes your climax. Ringmaster: Climax... vTimothy Q. Mouse: Gallopin' across the arena. Ringmaster's ear] He jumps from a springboard, to a platform, at the very pinnacle of your pyramid, and he waves a flag, for a glorious finish! Timothy Q. Mouse: [whispering again at first, then yelling once more] And who is your climax? The little elephant with the big ears! The woild's mightiest midget mastodon: Dumbo! Ringmaster: [snores as Timothy scurries away] What? Timothy Q. Mouse: Dumbo. Timothy Q. Mouse: [softer] Dumbo. Timothy Q. Mouse: [almost inaudibly] Dumbo. Ringmaster: [awake] Dumbo! I got it! I got it! Mr. Stork: Oh, one moment, please. This is still part of the service. Mr. Stork: Happy birthday to you / Happy birthday to you / Happy birthday, dear... uh-dear... Dear me, what's his name? Mr. Stork: Oh, Jumbo Jr. Right, Jumbo Jr.
Timothy Q. Mouse: [after Dumbo blows a zigzag bubble] That's a pretty strick slick. All right, let's see you blow a square one, pal. Timothy Q. Mouse: Say, that's very, very clever. Now blow a greaaaaaat big one! Timothy Q. Mouse: That's a pretty stri... Hey! Timothy Q. Mouse: You see what I see? Timothy Q. Mouse: [quietly at first, then lighting up excitedly] Climax?... climax! Dumbo, you're a climax. I'll be back in a minute, I'm gonna take care of your future. Elephant Matriarch: Is it possible? Giddy: Isn't there some mistake? Prissy: Just look at those... those... E-A-R-S.
Fidgity Elephant: Those what? Oh, ears! Fidgity Elephant: Oh, these! Aren't they funny? Fidgity Elephant: What did I do? Tell me, did I say anything? Elephant Matriarch: A perfectly harmless remark. Fidgity Elephant: I said they're funny looking, they are funny! Giddy: After all, who cares about her precious little Jumbo? Prissy: Jumbo? You mean Dumbo. Timothy Q. Mouse: [as Dumbo falls from his platform after the "magic" feather falls away] Dumbo! C'mon, fly! Open them ears! The magic feather was just a gag! You can fly! Honest, you can! Hey, open 'em up! Hurryyyyyyy! Timothy Q. Mouse: Whee! We did it! We did it! Let's show 'em, Dumbo! Power dive! Timothy Q. Mouse: [sleepily] Ohhhhhhhh! All those pink elephants. Jim Crow: Ah! Pink elephants? Mm-mmm! Timothy Q. Mouse: What's so funny? What're you boys doin' down here, anyway? Jim Crow: What're we doing down here? Well, hear him talk! Timothy Q. Mouse: [grudgingly, as he tries to get back to sleep] Ah, fly up a tree where you belong. Timothy Q. Mouse: [suddenly standing up, then staring Jim straight in the face] Brother Rat? Now listen! I ain't your brother, and I ain't no rat, see? Jim Crow: Uh-uh. And I suppose you and no elephant ain't up in no tree, either. Timothy Q. Mouse: No! No, me in no tree and I'm no... What? Tree? Timothy Q. Mouse: [gasps, then squeals as he hides in Dumbo's trunk] Dumbo. Timothy Q. Mouse: Dumbo. Wake up. Wake up, Dumbo! Timothy Q. Mouse: Don't look now, but I think we're up in a tree! Crows: [Pushing on Dumbo at the top of a cliff] Leeet's go! Leeet's go! Heaaave ho! Heaaave ho! Timothy Q. Mouse: Let's go, Dumbo! Crows: Leeet's go! Leeet's go! Timothy Q. Mouse: Come on now. Up, down! Up, down! One, two! One, two! One, two! Faster, faster! Build up flying speed! Detract your landing gear! Raise your fuselage! Take off! Timothy Q. Mouse: Hot diggety! You're flyin'! You're flyin'! Timothy Q. Mouse: [as he scrubs Dumbo's face after his act with the clowns, who are toasting him] See? They're drinkin' a toast to ya. Yeah, you're a big hit! Timothy Q. Mouse: Oh my, uh - You're terrific! Why, you're colossal, stupendous! C'mon, alley-oop. I'd better wash behind your ears. Timothy Q. Mouse: Ya oughta be proud. You're a - success. Timothy Q. Mouse: What's the matter with his ears? I don't see nothin' wrong with 'em. I think they're cute. Jim Crow: [as Timothy and Dumbo walk away sadly] Hey brother, now wa-wa-wait a minute. You don't hafta leave feelin' like that. We done seen the light. You boys is okay. Timothy Q. Mouse: Please. You've done enough. Jim Crow: But we's all fixin' to 'hep ya. Ain't that the truth, boys? Jim Crow: [plucks a feather from the youngest crow's tail; he yelps] Use the magic feather. Catch on? Timothy Q. Mouse: [accepting the feather] The magic feather? Timothy Q. Mouse: Yeah! I gotcha. Timothy Q. Mouse: Dumbo! Look! Have I got it! The magic feather! Now you can fly! Timothy Q. Mouse: [after Dumbo pelts the other elephants with peanuts; shouts joyfully] You're makin' history! Timothy Q. Mouse: [while watching the other elephants construct their pyramid, after a near-fall with one of them] Whew! That was a close one! They're almost ready now, Dumbo. Don't forget to wave that flag. Timothy Q. Mouse: Okay, okay, don't wave it no more, I saw ya. Now look, all you'll hafta do is run out, see? And jump on the springboard. Timothy Q. Mouse: All right, now show me just how you'll do it. Timothy Q. Mouse: That's it! Attaboy! That's the stuff! C'mon! Timothy Q. Mouse: Oh-oh-oh-oh-oh-oh-Dumbo! Oh, those ears! We'd better do somethin', quick! Timothy Q. Mouse: [as Dumbo drinks the water with the clowns' champagne] Listen, little fella: we may have had a lot of hard luck up till now, but you and me'll do big things together. Hold your breath. Timothy Q. Mouse: Why, your mother'll be so proud of ya, I'll be proud of you, too. The whole coicus'll be proud of ya. Now, whaddaya think of that? Swallow it. Timothy Q. Mouse: Ha-ha, they won't keep us down. Timothy Q. Mouse: Hey, whatsa matter with ya? Timothy Q. Mouse: What kinda water is this, anyhow? 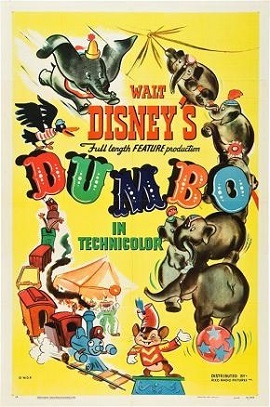 Jim Crow: [after taking his first look at Dumbo and Timothy sleeping in their tree] Ha! Well, hush my beak! Straw Hat Crow: Go ahead. Wake 'em up, brother. Glasses Crow: Yeah, find out what they're doin' up here. Fat Crow: And ask 'em what they want. Jim Crow: [shoving them all aside] Okay boys, leave it to me. Timothy Q. Mouse: [after the reprise of "When I See an Elephant Fly", when Dumbo, Timothy, and all the Crows land on a telephone wire] Dumbo, I knew you could do it! Wait'll we get to the big town! Jim Crow: Boy, them city folks is sure in for a surprise! Timothy Q. Mouse: I know how you feel, Dumbo, but you'll hafta pull yourself together. What would your mother think of ya, if she saw you cryin' like this? Remember, you come from a proud race. Why, you're a... a pachydoim, and pachydoims don't cry. What'll cryin' get ya anyhow? Nuttin' but the hiccups. Timothy Q. Mouse: There, ya see? Timothy Q. Mouse: Well - ain't nuttin' a little water won't cure. Timothy Q. Mouse: Ups-a-daisy. We'll get ya fixed up in a jiffy. Timothy Q. Mouse: Come on. [excitedly, but softly to himself] Timothy Q. Mouse: I can see it all now... [shouts ecstatically once again] Timothy Q. Mouse: "Dumbo! The ninth wonder of the univoise! The woild's only flyin' elephant!" Timothy Q. Mouse: [watches as Dumbo looks at the elephants with their backs on him, then walks away sadly] How do ya like that? They're givin' him the cold shoulder. Poor little guy. There he goes, without a friend in the woild. With nobody to toin to. Timothy Q. Mouse: Ah, I'll do somethin' about this! Timothy Q. Mouse: So you like pickin' on little guys, huh? Well, why don't you pick on me? Elephant Matriarch: [backs away in fear] Don't! Timothy Q. Mouse: [he whistles through his finger, which scares one elephant, then wiggles his nose, which scares another] A proud race. Overstuffed hay bags! Timothy Q. Mouse: They're still afraid of a mouse! Oh-ho, boy! Wait'll I tell the little guy! Ringmaster: All aboard! All aboard! Casey Jr.: All aboard! Let's go! Timothy Q. Mouse: [completely drunk while looking at bubbles] Balloonies. Timothy Q. Mouse: Hiya, George! Jim Crow: [as Dumbo rides off on the train] Boy, I wish I'd have got his autograph. Crow: Here, man, I've got his autograph. Jim Crow: Well, so long, glamour boy! Clown: Hey, be careful. Don't hurt the little guy. Skinny: Aw, c'mon. Elephants ain't got no feelings. Clown #2: No, they're made of rubber. Prissy: Girls, girls! Listen! Have I got a trunk full of dirt. Giddy: Gaining a little weight, aren't you, honey? Prissy: You're no cream puff yourself, dearie. Elephant Matriarch: Quiet up there! Tend to your work, girls. Elephant Matriarch: Out of my way, assassin! Casey Jr.: [climbing a hill] I think I can. I think I can. I think I can. I... Think... I... Can... I [goes down the other side] Thought I could. I thought I could. I thought I could. Woo-hoo! Ringmaster: Have I got an idea! What an idea! Timothy Q. Mouse: Huh. He never had an idea in his life. Timothy Q. Mouse: [smiling earnestly] Yeah! Ringmaster: And now, comes the climax! Joe: Yeah, what is the climax? Ringmaster: [chuckles] I don't know. Timothy Q. Mouse: I knew he never had nuttin'. Glasses Crow: Did you ever see an elephant fly? Preacher Crow: Well, I've seen a horse fly. Straw Hat Crow: Ah, I've seen a dragon fly. Fat Crow: Hee-hee. I've seen a house fly. Elephant Matriarch: Oh, I never thought I'd live to see the big top fall. Giddy: Because of that Dumbo, I never can show my face there again. Fidgity Elephant: Oh, look at my beautiful tail! Prissy: Oh, that won't be necessary, dearie. They fixed him good. Elephant Matriarch: What do you mean? Giddy: What did they do? Fidgity Elephant: Did they beat him? Giddy: What is it, Darling? Elephant Matriarch: Come, come, I demand to know! Prissy: Oh, well... they've gone and made him... oh, dear, I just can't say it. Elephant Matriarch: Out with it! Prissy: Made him a clown. Elephant Matriarch: Oh, the shame of it. Let us take the solemn vow. Elephant Matriarch: From now on, he is no longer an elephant. Timothy Q. Mouse: All we gotta do is build an act. Make ya a star. A headliner! Dumbo the Gr-eat! Timothy Q. Mouse: Uh-oh. The Great what? Glasses Crow: Why, he flies just like an eagle. Preacher Crow: Better than an airplane. Jim Crow: Brother, now I've seen everything! Jim Crow: Quiet, gentlemen. The Reverend Rodent is gonna ad-dress you. Fidgity Elephant: Can you bear it? When she doused the Ringmaster, I just thought I'd die! Giddy: Well personally, I think she went a bit too far. Elephant Matriarch: After all, one musn't forget one is a lady. Fidgity Elephant: Oh, you're right, dear. Giddy: Oh, well, I suppose that's mother love. Singer: I can stand the sight of worms / And look at microscopic germs / But Technicolor pachyderms / Is really too much for me. Singer: I am not the type to faint / When things are odd or things are quaint / But seeing things you know that ain't / Can definitely give you an awful fright / What a sight! Chorus: Chase 'em away! Chase 'em away! / I'm afraid / Need your aid / Pink elephants on parade. Ringmaster: Ladies and gentlemen, you have now seen the impossible accomplished in front of your faces. Seven jungle giants, each weighing not one ounce less than 4,500 pounds. Elephant Matriarch: [over the Ringmaster's announcement] That windbag! Why doesn't he come to the point? Ringmaster: And now, I present to you the world's smallest little elephant, who will spring from this springboard in one spring to the top of the pyramid, waving his little flag for the grand climax! Ladies and gentlemen, I give you... Dumbo! Timothy Q. Mouse: [leads Dumbo to the cage where Mrs. Jumbo is kept] Oh, right over there. Cozy little place, ain't it? Timothy Q. Mouse: Mrs. Jumbo! I hope she's in. Timothy Q. Mouse: Someone to see ya! Elephant Matriarch: Take your foot out of my eye... clumsy ox! Glasses Crow: Well, looky here, looky here. Preacher Crow: My, my. Why, this is most irreg-lar. Straw Hat Crow: [rubbing his eyes] Well, I just can't believe my eyes. Glasses Crow: They ain't dead, is they? Fat Crow: No. Dead people don't snore... or do they? Jim Crow: [all the Crows whisper until he flies down, then gestures for them to move aside] Uh, what's all the ruckus? C'mon, step aside, brother. Jim Crow: Uh, what's cookin' 'round here? C'mon, what's the good news? What's fryin', boys? Glasses Crow: Just look down there, brother. Fat Crow: And prepare yourself for a shock. Timothy Q. Mouse: Look at that house. Dumbo, you're standing on the threshold of success. Don't look down, it'll make you dizzy. Boy! Are they in for a surprise! Timothy Q. Mouse: Got the magic feather? Prissy: Well, frankly, I wouldn't eat at the same bale of hay with him. Prissy: To hear him talk, you'd think he was going to do it. Elephant Matriarch: The stuffed shirt! Ringmaster: ...pyramid, of ponderous, pulsating, pulchritudinous pachyderms! I give you the elephants. Narrator: Through the snow, and sleet, and hail / Through the blizzard, through the gale / Through the wind and through the rain / Over mountain, over plain / Through the blinding lightning flash / And the mighty thunder crash / Ever faithful, ever true / Nothing stops him, he'll get through. Jim Crow: [singing] I seen a peanut stand /And heard a rubber band /I've seen a needle that winked its eye / But I been done seen about everything / When I see an elephant fly.